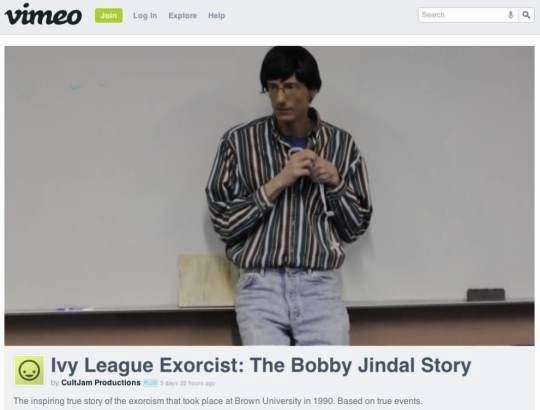 The first article about the film Ivy League Exorcist: The Bobby Jindal Story was published in the Baton Rouge Advocate; the story by political journalist Michelle Millhollon, gave us the immortal quote by Jindal's spokesman, Kyle Plotkin, that the film was "insane." (the quote was used for the movie poster). Speculation about who will be Republican presidential hopeful Mitt Romney’s running mate is re-igniting interest in Gov. Bobby Jindal’s so-called exorcism experience. National political writers and filmmakers recently took note of the governor’s college activities after Jindal emerged as a possible contender for the vice presidential slot. Long before he ran for governor, Jindal made the experience public by writing about it in a 1994 issue of New Oxford Review, an orthodox Catholic magazine. He described his college friend Susan’s battle with a “demon” before a group of Christian students on the Brown University campus. “At first, Susan responded to biblical passages with curses and profanities. Mixed in with her vile attacks were short and desperate pleas for help. In the same breath that she attacked Christ, the Bible’s authenticity, and everyone assembled in prayer, Susan would suddenly urge us to rescue her. It appeared as if we were observing a tremendous battle between the Susan we knew and loved and some strange evil force,” Jindal wrote. Jindal wrote that he physically protected Susan with holy water and blessed crucifixes. Now Jindal’s experience is the inspiration for a film shot in California on a $300 budget. The roughly 11-minute video, which as of Friday evening had gotten 20 views on YouTube, purports to depict the experience described by Jindal. Foul language is used. An actress playing Susan thrashes about on the floor. The bespectacled man playing Jindal is mostly shown hanging back, watching the scene unfold from afar, while narrating the episode in a voice-over. Although he usually issues at least a prepared statement in response to an interview request, Jindal refused to do so when asked Friday about the film. The film’s writer and producer, Troy Davis, of Los Angeles, said he created the video because he was flabbergasted when he read the New Oxford Journal article earlier this year. He said the experience that Jindal described was bizarre and demented. “I wanted to throw it back to people and say, ‘Hey, make up your own minds,’ ” Davis said in an interview. Davis, who holds degrees from Ohio universities, put out a San Jose, Calif., casting call in March for preppy students and an angelic savior. The parts of Susan and Jindal already had been cast. Davis said CultJam is not into commercialization, Hollywood or even politics. He said he sees Jindal as a victim of satanic panic. “I’m an independent. Sure, I’m going to vote for (President Barack) Obama, but I’m not carrying his water by any means,” Davis said. The video is not the only piece on Jindal’s so-called exorcism experience posted on YouTube. A search for that topic produces several dozen hits. One clip features a shot of Jindal’s head bobbing around the screen as a man speaks through the screen of a roaring fire. Time magazine described the so-called exorcism as an obvious downside in Jindal’s “glittering” résumé. “Without casting any aspersions on Jindal’s beliefs, it’s safe to say that Romney, who has dealt with an undercurrent of bigotry toward his own faith, likely wants to avoid a protracted discussion of religious practices that would overshadow his focus on the economy,” the magazine said.